Evidence from research have shown that IITA had—by 2015—contributed to lifting over 4,306,621 people in sub-Saharan Africa out of poverty through the adoption of improved agricultural technologies developed by the Institute and its partners. This is the evidence from four completed case studies that were presented by Dr Victor Manyong, IITA Director for Eastern Africa hub during a seminar titled ‘Tracking Poverty Reduction Associated with IITA Technologies’ at the hub offices in Dar es Salaam, Tanzania, on 26 May. 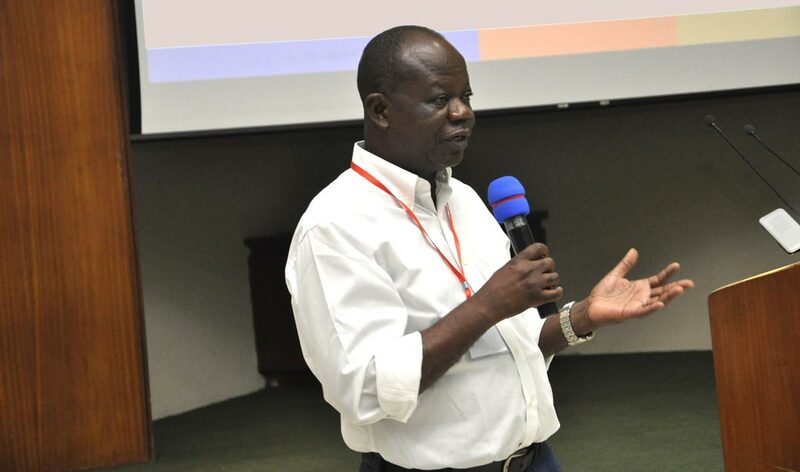 Victor Manyong highlights IITA’s pivotal role in poverty reduction in sub-Saharan Africa. Manyong said poverty reduction was one of IITA’s key performance indicators and the studies are part of efforts to track and document the Institute’s progress towards achieving its vision of lifting 11.6 million of population out from poverty by 2020 as spelt out in its refreshed strategy. Two studies conducted this year in Nigeria on the impact of adoption of improved cowpea varieties and drought tolerant maize varieties (DTMV) found that the two technologies had contributed to getting an estimated three and a half million people out of poverty in Africa’s most populous country. The study ‘Impact of adoption of cowpea germplasm on poverty reduction in Kano State, Nigeria’ used DNA tests to link the improved cowpea varieties being cultivated by farmers to the IITA collection at its genebank in Ibadan, Nigeria. By 2012, 58% of cowpea farmlands was cultivated to improved varieties with yield gains of 254% over local varieties. The study found that 884,241 people had been lifted out of poverty cumulatively between 1980 and 2015. It also established that the nutritional status of children below five years was higher among those who had adopted the technologies compared to the non-adopters. The other studies conducted in 2015 included a baseline study of the Support to Agricultural Research for Development of Strategic Crops in Africa (SARD-SC) and an impact study of the Consortium for Improving Agriculture-based Livelihoods in Central Africa (CIALCA) which collectively showed further that over 750,000 people were lifted out of poverty in association with IITA technologies. The SARD-SC baseline looked at the adoption of improved cassava varieties introduced by IITA and partners in Zambia, DR Congo, Tanzania, and Sierra Leone. It established that 194,469 farmers were lifted out of poverty from growing the new high-yielding varieties. Further disaggregation of the results by gender showed that more female-headed households had moved out of poverty than male-headed households. The CIALCA initiative contributed to lifting 559,810 people in Burundi, eastern DR Congo and Rwanda out of poverty. CIALCA had developed and disseminated a complex set of technologies including improved crop varieties combined with crop management practices, integrated pest management practices and marketing strategies. Productivity levels were found to be higher among the adopters compared to non-adopters. Manyong said while these studies had shown that the adoption of technologies generated by IITA and partners had contributed significantly to poverty reduction the impact would have been higher if more people had adopted the technologies. The lessons from this study will be used to refine tools to track the Institute’s progress in reducing poverty in future planned impact studies on other technologies that IITA has disseminated. These include improved varieties of soybean, yam, banana and plantain varieties, banana/coffee intercropping and Striga control, among others.